Capital Juniors wants to ensure that more DC-area students have the chance to experience rowing and to make their own memories on the water. To make rowing safe, affordable, and accessible to as many DC-area students as possible, we’re raising money to support Capital Juniors outreach and operational expenses. This fundraiser leads up to our annual Ergathon, an event where the team will collectively row 250,000 meters. That’s how dedicated the Juniors are to the team! Help more kids get on the water and earn their seat in the boat. By supporting Capital Juniors, you’ll ensure more DC-area students can join a team that emphasizes teamwork, personal accomplishments, fitness, and friendship. Any donation will go a long way to helping me meet our 2019 fundraising goal, and all donations are tax deductible. Calling All DC rowers and fitness fanatics! Join us on February 23, 2019, from 9:30 am to 12:00 pm for a 250,000-meter rowing and fundraising competition! 1. Donate to the Capital Juniors Ergathon. Click here to donate to our cause. All donations directly support the Capital Juniors Program. 2. Join a relay team. Are you interested in joining our Juniors rowers on a relay team? Click here to sign up and join in the fun! 3. Volunteer at the event. Capital Juniors needs your help to run a successful event. Click here to sign up. 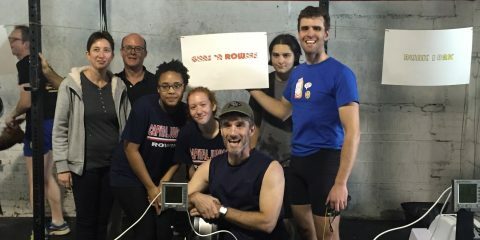 Capital Juniors, a program of Capital Rowing Club that combines academics and competitive rowing to build in DC’s young people discipline, camaraderie, fitness, and stewardship for the Anacostia River. Through our program, all DC youth, especially those from low-income areas, have access to rowing and academic support and can apply the lessons they learn in excellence toward successful futures. Levels of Involvement What to do What does it mean? I don’t want to row, but I want to fundraise Donate to the ergathon! Every dollar counts! Your donation directly supports the Capital Juniors Rowing program. I’ve never rowed before, but this intrigues me. Come cheer people on! Don’t be shy. We’ll have coaches on site to give you technique demos. It’s a great way to engage with our Junior athletes, and learn rowing. If you like it, register at the event to become a Capital member or check out a Learn to row class! I just want to watch. Come cheer people on! Come to the event, eat, and have fun! I want to help the day of! Sign up to volunteer. You’ll get to hang out and get volunteer hours!